While much of pop culture today is siphoning through old ‘90s grunge for a retro fix, photographers like Robbie Augspurger show us what it is to truly appreciate the past. The Oregonian has an eye for shining light on odd pop-culture archives – old VHS covers, Olan Mills family photos – and honing that obscurity into modern shots for bands like Wampire and Blitzen Trapper. 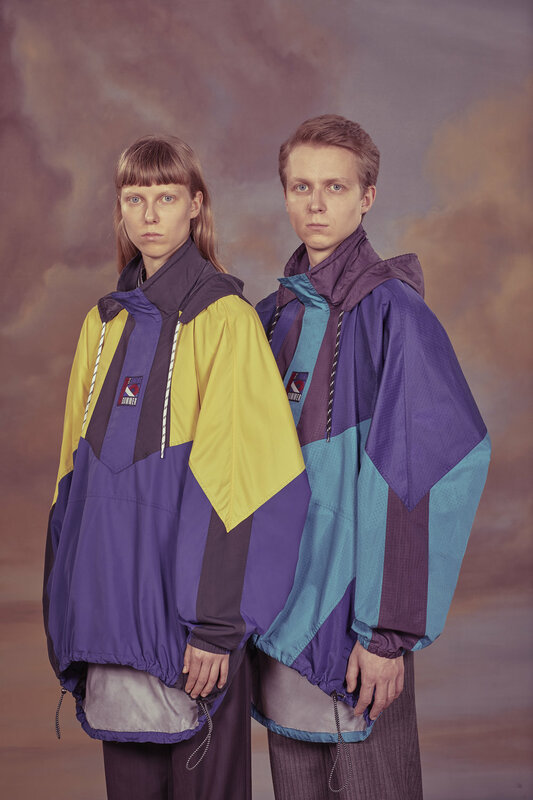 His photos often hint at humor, but more than anything they're alluring, so much so that Balenciaga picked Augspurger out of the blue in fall of 2017 and put him at the helm of shooting their spring line. Since then, Augspurger has launched into working with Louis Vuitton, Numéro, and was even profiled by Vogue. He hasn't lost his taste for the old stuff, though. How you initially got into photography? It kind of started when I was a kid – I got a camera for my 12th birthday – and got more serious when my buddy's dad noticed I was good at it. I went camping with a family friend, and my friend's dad was a professional photographer, primarily a wedding photographer. I had my camera with me and I was taking pictures the whole trip. I showed him the pictures, and he noticed that I had an eye for portraiture and offered to start taking me along to jobs, so he'd take me to weddings and train me. I never really pursued the wedding industry, but tagging along on all those weddings helped me hone my skills. From there, I branched out into different areas and collected old cameras and all that. Your aesthetic feels like this mesh of ‘80s glam dampened down by the dreamy ‘70s soft pastel tones. It's funny you say weddings; the idea of pastels totally makes sense. How did that style develop? Well, that same guy who mentored me with the camera stuff, he owned a photo lab that catered to professional photographers. When I graduated from college in 2002, he hired me to run the photo lab. I was in the mix of all these older photographers who'd been in the business since the 80’s. They had a back room at the lab; it was an old bank vault, so you opened this 800-pound door and there was this room [with] all of their old work piled up against the walls: old portraits from the ‘70s, ‘80s, and ‘90s, blown up real big. It was like senior portraits and really gooey soft-focused wedding photography, people standing in an autumnal meadow, hands on each other's shoulders. That was like good photography back then; it was not a joke. That style was not for this current generation that looks back at it and laughs. I was amused that this was good, cutting edge stuff. In the span of six months, you went from casually taking photos to working with Balenciaga, Louis Vuitton, and being interviewed by Vogue. How did you move from A to B? I'm a total outsider; I was just kind of flown into it. I got an email in mid-October of last year from Balenciaga, directly asking me if I wanted to shoot this campaign. I didn't know what to make of it – I thought it was some kind of scam. So I hit up a buddy of mine, Parker Fitzgerald, and was like what is this, is it real? And he said, holy crap it's real. Three weeks later, I was on a plane to Paris. It was cool. I had never really considered fashion photography as a way I could go. There's commercial photography and fashion photography – commercial you're gonna shoot stuff for Burger King or something like that, Colonel Sanders or whatever – and then there's the fashion side of it which is still commercial but it's creative; you have the ability to do whatever you want. That's what attracts me to it. Anyway, I was shocked [Balenciaga] would consider me. Your style is rooted in a semi-humorous way. Bringing that into the fashion world, are there still elements of that humor? How does that work for you? I guess one of the things is, even when I'm not trying to be funny, it always ends up looking amusing in some way, even if it's not outright hilarity. It comes naturally, regardless of the context. Some of the fashion stuff looks kind of serious sometimes. But the people who approach me want that touch of goofiness I bring to things by default. I'm not trying to parody or take a dig at the past. I'm trying to be respectful and do them proud. You have a musical project as well? Ozarks? Does music and photography feel like two separate creative spaces? Is it possible to differentiate? It's the same. My music refers to obscure lost ideas. Musically, it's almost the same thing: I'm trying to recreate sounds on old records I like, or the production style. The guitar solo in “As I Lay Sleeping,” is tone-wise trying to mimic the tone in the Badfinger version of “Without You.” We liked that, so we did that, but no one's gonna know that. Is that the one of the guy with the kid and the helicopter? There's a movie called “Hard Ticket To Hawaii.” I run a movie event called “B-Movie Bingo” which shows ‘80s and ‘90s direct-to-video action movies, or Indonesian or Australian action movies that are pretty lost to history. My photography also refers to tons of promo photography that I see on those boxes. VHS aesthetic is very much in my blood. Simple background-wise – the whole reason I started doing the headshots was in 2009 [when] a friend hit me up about doing headshots because he wanted to become an actor. He came in costume with all these different ideas and I didn't have a background, so I just used a cubicle wall I'd been using as sound reinforcement for my recording studio and leaned it against a wall. It's very limiting – it's only five feet by maybe three feet – that's why all the portraits are so tight. I had to set it up in my basement and only had a small area to work in. If you knew what to look for, you'd see reflections on the glasses, because I don't have enough ceiling height to get the lights above the curvature of the lens. That all became part of the aesthetic. I also give people characters and they kind of become that character in the portraits. That's an important element of my photography. It might be kind of rare for a photographer to give a portrait subject a character or role, but most people respond well to it regardless. I don't know, I'm sure everything's been done, so whatever.